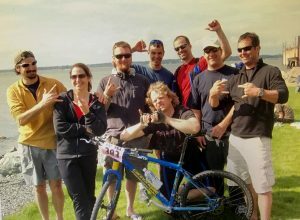 Ever wonder what it would be like to compete in the Ski to Sea relay race that stretches from the slopes of Mount Baker Ski Area through the waves of Bellingham Bay? The Tumwater Shadies relay team has taken up the challenge since 1993. 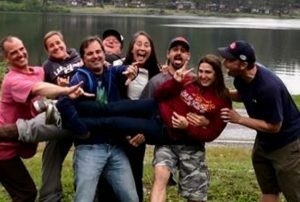 The eight-member tag team competes by cross-country skiing, downhill skiing, running, road biking, canoeing, cyclocross biking, then finally kayaking across the bay to ring the finish bell. “Dropping 5,000 feet over 93 miles in seven legs, there’s no race quite like it,” says team captain Gregor Myhr. The Tumwater Shadies know every inch of the course. “We’ve got to be one of the longest standing teams,” says Gregor. “Over 20 years, we’ve gotten dang good at it.” Gregor, his wife Hollie Myhr, Greg Rabourn, and Adam Stocks are founding members. Dan Jones, Katherine Halmos Jones, and Aubrey Nelson are relative newcomers. Teammates have varied through the years, but most live in the Tumwater-Olympia area. The race lures the team up I-5 to Bellingham each year. It has become a Memorial Day weekend tradition. The race is on Sunday, but the group makes a long weekend of it. Three days filled with family, friends, and fun. The rest of the year, the members stay in touch over social media. “We prompt and prod each other along in our training,” Gregor says. Gregor and his wife Hollie attended Western Washington University after graduating from Tumwater High School in 1992. 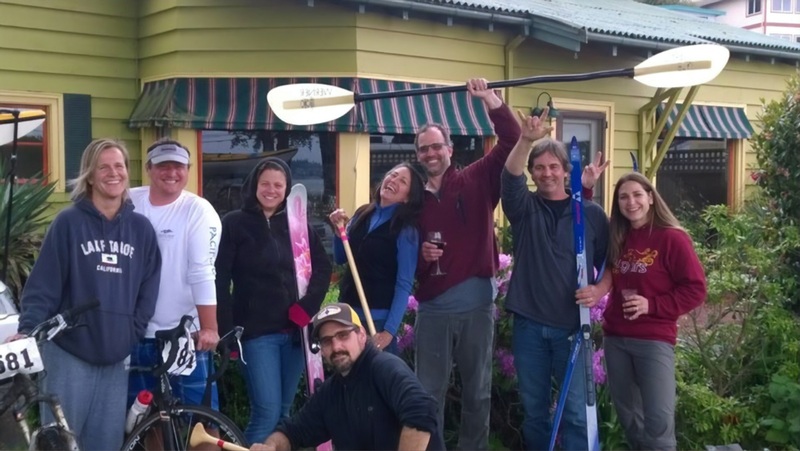 That is when they learned about the Ski to Sea race. They were young, fit, and outdoorsy. “We thought, we’re capable of doing this. There are seven legs, so I’ll recruit some buddies I grew up with,” Gregor recalls. With that, the Tumwater Shadies team was formed. “The fun factor of the race is really high,” says Gregor. Locals really get into it, competing and cheering on racers. A lot of competitors wear costumes. He remembers one year starting off the race in the cross-country skiing leg by chasing a guy wearing a tutu. For 22 years, Gregor started the race as the team’s cross-country skier. The other teammates also specialized in one sport. That changed when Dan Jones made it a goal to conquer a different leg of the race each year. Last year, Dan met the challenge, having successfully competed in each of the seven sports. “Dan and Katherine Jones changed our whole ball game,” says Gregor. “They are natural athletes. When they joined the team, they brought our time down, so we invited them back,” he laughs. The Shadies’ race experience really pays off. Knowing exactly what is needed, where to go, and how to get there on race day works to their advantage. No night-before anxieties for this team. They just relax and enjoy time with each other. “We have the logistics so dialed in, it’s not even a consideration anymore,” says Gregor. The team likes to rent a house where they all can stay together. With several couples and kids involved, finding space for everyone can be challenging. Race years are often marked in their memories by the different houses they’ve rented. Once settled in though, they eat, drink, and play games with the kids. Weather can be a big factor come race day. 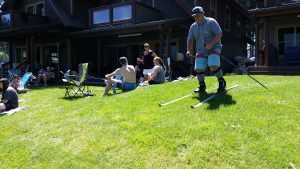 Usually, it is a case of adjusting to conditions, but in 2015 there was so little snow, race organizers had to substitute two running legs for the cross-country and downhill skiing events. That was a tough one for Gregor. Running up hill at the ski resort was not something he had prepared for. Other racers struggled as well. “I’ve never seen so many people sucking air at one time before,” he shares. “I finished it!” he exclaims, but not before losing his breakfast at the top of the hill.